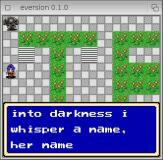 Description: A 2D tile-based cross-platform RPG engine. A 2D tile-based cross-platform RPG engine. Sorry, I couldn't find much more info about this one. Zelda clones for AmigaOS 4.0 with it!